The incident, in which a vacationing woman was bitten on the foot, is the first documented case of a rabid otter in Maine. ROCKLAND — An otter that bit a vacationer on a beach this week has tested positive for rabies, the first documented case of a rabid otter in Maine. Animal Control Officer Troy Peasley reported Friday that the otter, which bit Laurie Nevins, of Myrtle Beach, South Carolina, on Wednesday, had tested positive for rabies at the state lab after police had to shoot the animal. Peasley said the otter would likely have died within three to seven days from the disease. He said it is the first documented case of a rabid otter in Maine since the state started tracking cases of rabies in 1994. Laurie Nevins and Westley Marshall of Myrtle Beach, S.C., talk about being attacked by an otter at Sandy Beach in Rockland on Wednesday. In an interview Thursday, Nevins said she had not provoked the river otter that charged across Sandy Beach in Rockland, biting her in the ankle and foot. “I always thought otters were friendly,” she said. 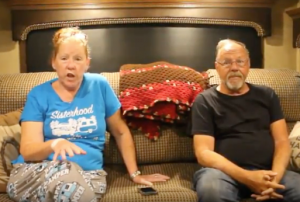 Nevins has been visiting the midcoast as part of an RV trip with her husband, Daniel, and their friends, Westley and Christine Marshall. They went to Sandy Beach in the South End on a sunny day to collect sea shells and look for sea glass. There were a number of children and parents also on the beach when a river otter came ashore. She said it started chasing children. “The thing was going crazy chasing them around,” she said. Nevins was taking a cellphone video of the otter when it rushed up to her, did figure-eights around her feet and then latched on to one foot and would not let go. Westley Marshall attacked the otter with a shovel. Marshall eventually chase it back into the water. He said it was making a hissing sound. The otter returned as the group was leaving, and members of the Rockland Police Department and the Maine Marine Patrol were called. Nevins said she and the group then tried to flee from the beach by going up a set of concrete steps, but as they were trying to leave, the otter returned. Nevins went to Pen Bay Medical Center, where she said the doctor said he had never dealt with an otter bite before. She will have to undergo shots to prevent her from contracting the illness. She said that because the otter bit her foot, the rabies virus would take longer to spread to the rest of her body. 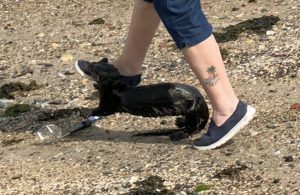 Rockland Police Deputy Chief Chris Young said the first complaint about the otter came in around 2 p.m. Wednesday, when a bystander at the beach reported that some children had been near the otter. Rockland police responded initially and chased the otter, which went along the rocks down to the Dragon Cement property in the South End. At that point, he said police stopped chasing it, believing the otter was no longer a threat. The otter bit Nevins later that day. Young said the attack was the first report of an otter problem at that location, and urged residents to stay away from wild animals.